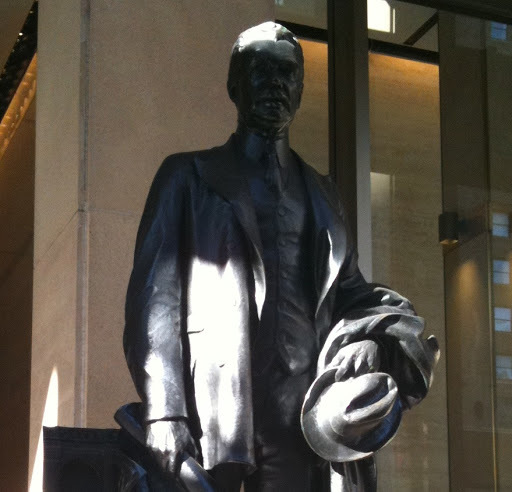 Collins suggests readers start at 2 Penn Plaza where a statue stands of Samuel Rea—president of the Railroad from 1913 to 1925. Rea, whose career path found him working as a clerk in a country story, was a major figure in American transportation. In 1871, he joined the Penn RR as a surveyor's assistant at the age of 16. He was responsible for connecting the Penn RR to Manhattan! He negotiated access to the city from Jersey City via the Hudson River. Originally, he had plans to build a bridge, but when he could not get permission, he went under the river. Once in Manhattan, he linked Penn RR to the LIRR by way of the East River. The statue was once positioned near the staircase leading down into the main waiting room (a scene that I attempt to recreate later in the post), but now serves as a handy pigeon roost. 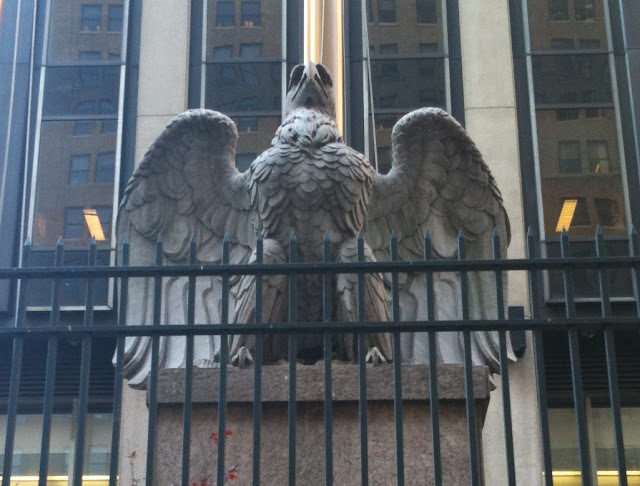 Heading south from Rea along Seventh Ave toward 31st Street, we encounter a massive eagle confined within a fence—if you walk north along Seventh Avenue, you'll find another eagle in a parallel position, but heading south keeps the tour moving. There were twenty-two eagles that graced the original building. Only two have been saved here. The rest have been scattered far and wide, including the Market Street Bridge in Philadelphia and the US Merchant Marine Academy in Long Island. 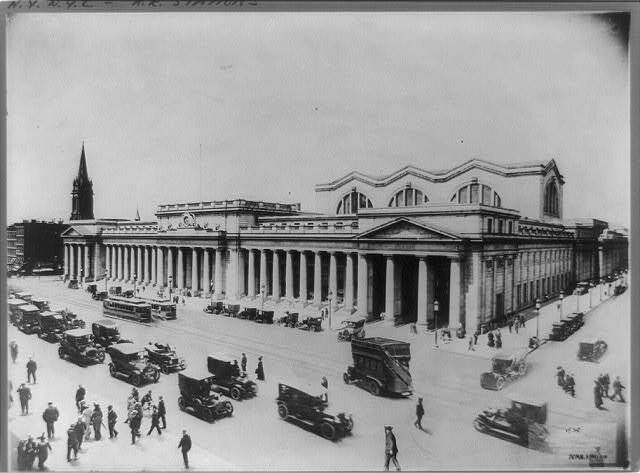 On 31st Street, heading west we'll find the facade of Penn Station's former coal-fired power plant. Currently, it's used for storage and backup power systems, but at least it has maintained the illusion of its original role. From the middle of the block, we can access the terminal building via a short walkway that heads north. The entrance to the terminal building puts us at the top of the escalators, which marks the location of the original grand staircase. The Rea statue once stood to the right. I've tried to recreate the original setup below, but the effect isn't quite the same. The rotunda in the center of the room was a fantastic spectacle to behold. Under a 15-foot ceiling, the room was modeled after the Baths of Caracalla. (Incidentally, Andrew Leicaster's Ghosts Series presently installed throughout the LIRR station downstairs is meant to invoke this bit of Roman history.) The waiting room in the center of the space, which resembles a vision of the future from the late 1980s—sort of like a futuristic-nostalgia—occupies the same space as its predecessor. Of course, in the early history of transportation, there would have been separate spaces for male and female travelers. Women's waiting room, Penn Station. Heading along the left side of the waiting room, if we walk all the way to the back where the West Gates to Tracks 5 and 6 are, we can glimpse one of the few remaining original brass and iron staircases. According to Turkeli, the rest have been replaced by escalators. One of the last remaining original staircases, 2010. Downstairs in the the LIRR station, the waiting room's entrance is marked by a Tuscan red, cast-iron partition with beveled-glass windows, which is also original to the building. And if we take the escalator up to 34th street, we can walk under a suspended four-sided clock also believed to have survived from the original station. Four-sided clock purportedly from the original Penn Station, 2010. In my original post, I admitted to being troubled at the loss of history for the sake of progress. But hard decisions have to be made for any number of reasons that sometimes don't leave room for history. In an urban environment, where space is at a premium, history is often absorbed—and sometimes a trace lingers. It's a shame, I think - older public buildings were made to last, and to be testaments to our culture; new public buildings are these soulless things which are usually intended to last maybe a couple of decades at best. I wonder what factors have changed, that we've gone from long-lasting cultural temples to disposable boxes? Sorry, I'm just getting to this now, H. I've been playing catch-up from scio11 all week. Cultural temples are expensive and large, though beautiful. I think the rise of industry and the influx of people into urban areas, who need housing and other services has played a large role in the demise of elaborate urban architecture. However, that could easily be the me that's disappointed by the loss of the original Penn speaking. No worries, Krystal. Rumor has it that you have a life. Expense, and the flow of money, are important. However, history suggests that urbanization is not the reason public buildings are no longer cultural artifacts; many of the culturally-significant buildings in the US were built in the first half of the 20th century, a time which saw MASSIVE urbanization. During that time, a great deal of money was donated toward cultural efforts - how many "Carnegie Hall"s have you heard of? - and I think perhaps that created an atmosphere in which prominent community members felt compelled to contribute as well, which probably influenced even city planners. I'm reminded of Rome, during the days of the Empire, when various Patricians would build significant public works such as roads and aqueducts - things which today would be the sole province of the municipality. Unfortunately, such a system yields vast inequality - great cultural temples, yes, but the poor and other "undesirables" shuffled off into sardine-can housing, or into wretched institutes... anything to keep them out of sight. The question then being, how might we create such an atmosphere of public interest without having the negative aspects?